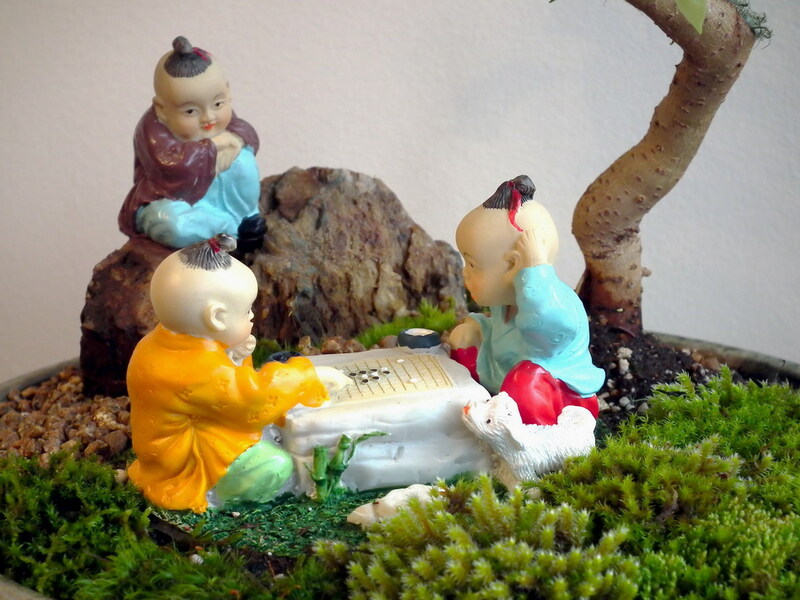 Game of GO aka Wei Qi, is a Chinese board game invented about 4000 years ago, later "exported" to Japan (known also like Igo), Korea (named Baduk) and in the 20th century, it started to be played all over the world. Game of GO is one of my husband's favorite game (he is a Master 3 Dan GO player) and we spent many hours playing GO with the kids in our weekends - it is a game of strategy perfect to teach kids about how to concentrate for long time, to be patient and respectful and to better prepare for today's competitive society. Long time ago we included this group statue of children playing GO (including the observer boy and their friendly dog) to our GO players figurines collection. 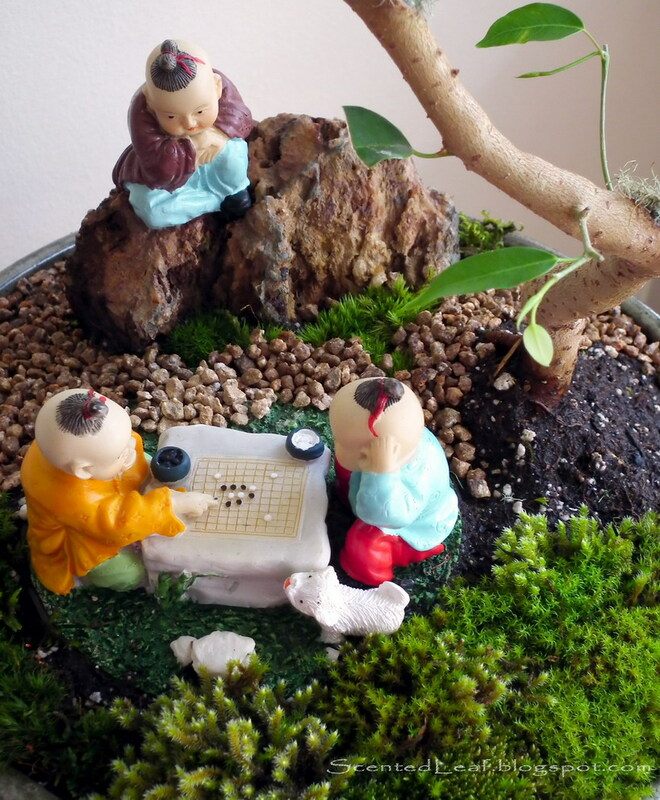 Last month, after one of the weekend's "Family GO Cup", we planned to put them in more value by creating a miniature landscape that tells the ancient story of the Game of GO. Last week we carefully planned our Saikei, and decided to use for this project one ceramic pot with 26 cm diameter and 5 cm high. 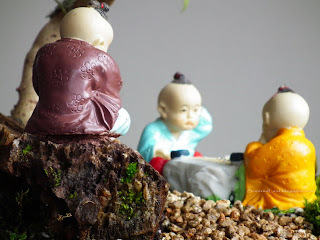 It is a four-legs glazed ceramic pot with rusty iridescent green-brown on top and cream-whitish spots on the bottom; colors according with our vision of what the miniature landscape should became. We selected one indoor pre-bonsai and some rocks suitable for this arrangement. We considered that a slanting styled Ficus Wiandi (you can read more about ficus Wiandi in my previous blog post "Ficus Wiandi - Air Purifying Bonsai") with 30 cm high and 28 cm width is in harmony with pot dimensions and with the size of characters. 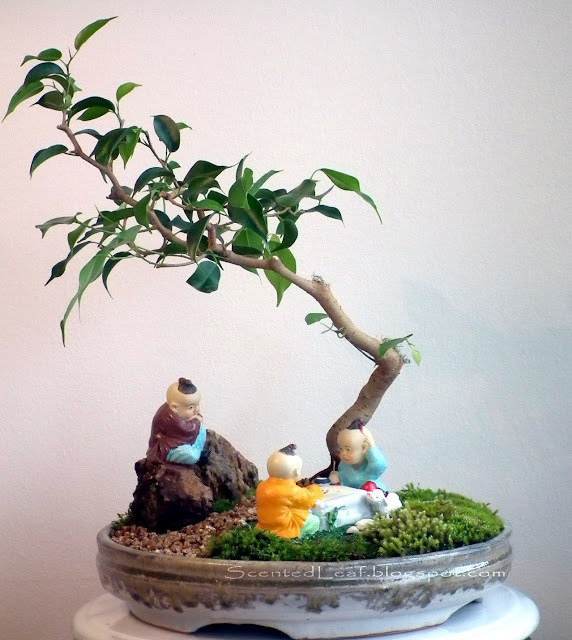 The Ficus was grown in a deeper terracotta pot for the last year and initially we were afraid that the roots will not fit in the new shallow pot (without severe pruning), but in the end its roots were perfectly fit. 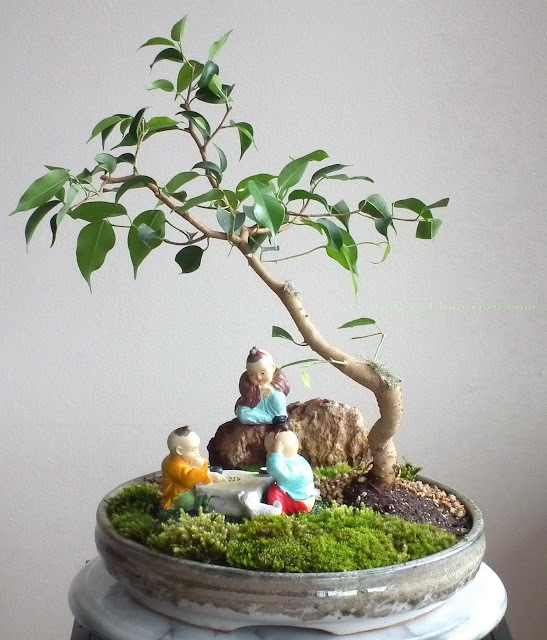 Still much work to be done until it will be a real bonsai, but for sure with minim care and great patience and ... using the pruning repeatedly (snap very easy and we can not use wiring), it will became captivating. 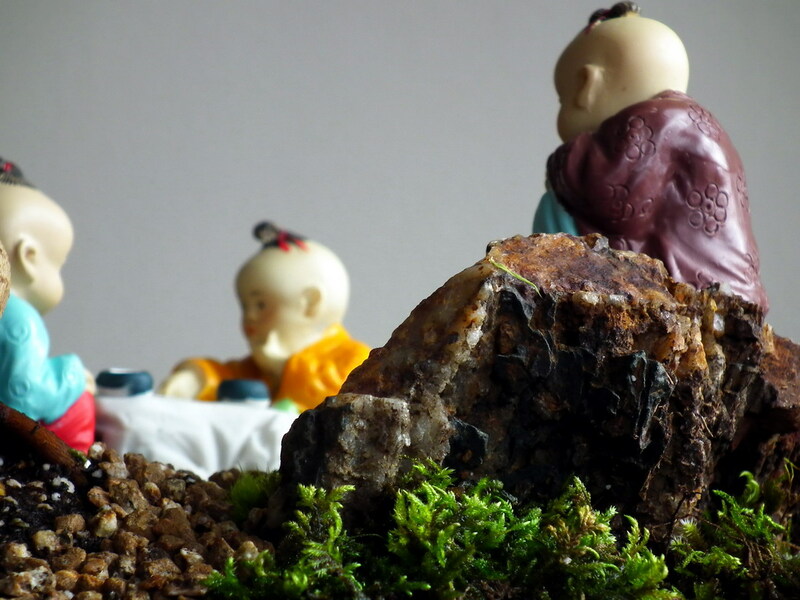 The pedestal rock is a brown-cream calcite rock with some moss grown on the side. Few types of moss as a ground-cover and Akadama paved path, creates the illusion of a real situation. We choose very carefully the place of every "actors" and hopefully you can feel how the tension is built around the GO board (even the puppy is watching). Can you feel the stage serenity? Everything stopped, the scenery is timeless and peaceful ... like in the legend of Ranka - when a Chinese woodcutter was so fascinated by a two strange old men who were playing GO in the wood, and watched them for so long, until his axe handle has rotted to dust and no-one remembered him in his native village. How cute! I love the details and how "into" playing they look! That is a very serene setting. The board game itself looks like it's loads of fun! I'm your newest follower from the Boost My Blog Friday Blog Hop. If you get a minute please drop by and follow back. Have a wonderful week! You did a great job placing everything. Everything looks like it is in exactly the right place. I'm your newest follower from the Boost my blog hop. Great job! I look forward to reading future posts. Thank you everybody for your lovely comments and the support you have shown us.